While attending FETC 2012, I found myself hearing echoes of edtech gurus calling for educators to have a digital presence. It really is so important – whether a classroom educator or administrator – to have a presence on the Internet; a place to provide some transparency to the happenings in your classroom or school. Do you currently leave a digital footprint? For the sake of this post I am going to discuss two things. First, I will review the key points that I make in my Blogging with a Purpose workshop. I will follow that up with some additional options for educators in addition to the “Digital HUB” I will discuss first. We educate students that are immersed in a digital environment. From the songs they listen to, to the way they communicate, to the content they digest – everything for them comes in a digital format. If we, as educators or school leaders believe that we do not need to educate in the digital – we are dead wrong. Students need educators and schools to maintain a digital footprint – one that they can follow to continue the learning on their time. Think of your “Digital HUB” as a place where your classroom is open not only to students, but parents and the community. Think about the transparency that you provide any stakeholder that is interested in seeing what you are doing with your students. One very important point about creating the digital footprint is interaction. This digital presence has make student want – not force them – to interact with the content. 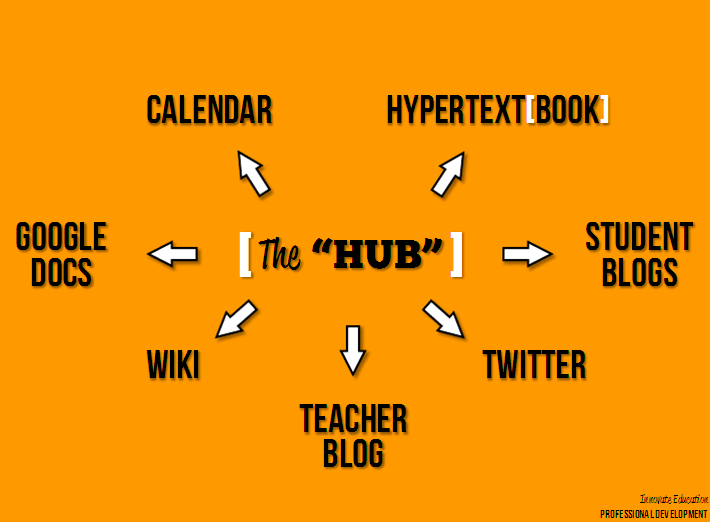 You have to find the right mix of to bring students to your “HUB” to interact with the content. This interaction is how your students will become engaged. Without it you will not see students using it to engage in their learning. If you are a Googleite, like me, you may find that Google Sites is the place for you. You can visit my Google Site here, however, I am now out of the classroom and it has not been updated – but you can use it as a formatting guide. Google Sites allows you to build a website. I has lots of options for you and is fairly easy to use for the tech savvy educator. I also like how well it integrates with other Google Apps for Education, such as Google Calendar and Google Docs. If these are technologies that you already use – then Google Sites is a great option. At FETC this year, Edmodo was all the rage – and for good reason. I have used Edmodo for professional development purposes, and I can see how this could just connect with students. First, it looks, acts, and feels like Facebook. It is definitely a technology that most students are comfortable with, which means a small learning curve. Edmodo allows for posting of materials, ease of communication to students (and parents if they have the access code), a more closed environment, and the ability to group students (i.e. periods, sections, etc…). I would encourage you to check Edmodo out and play around with it to learn its true potential. It is a technology that I will continue to use for professional development and also recommend to my teachers. What if I am not a classroom educator, or I just am not ready for this. Well, there are other ways to go about creating a digital footprint. A blog is a great way to begin. It will allow you to publish content and your thoughts to the web. It allows you to begin with one-way communication (output) to students – and also publish some materials. You can continue the classroom discussion, and post announcements and such. The limitation is the engagement piece discussed earlier. Now principals, this is your bread and butter. I am a believer that every principal should maintain a blog. It is a great way to communicate about your leadership, you school, and your students to all of the stakeholders in the community. If I were a principal it would be a top priority to publish to a blog and grow a readership – I think that this type of transparency is vital to school success in this day and age. Two recommendations are WordPress and Blogger, both free. If you are still not sure about Twitter – the time is now. This may be one of the most revolutionary technologies to help transform education. The amount of professional material that is out there is infinite. You MUST, as an educator in 2012, be on Twitter. There are plenty of people blogging about it and you can find out a bit more here. This, however should be a non-negotiable for educators today. You can find me on the Twitter @innovateed. Today’s students and school community need to have the option to receive content in a digital format. This can only be achieved when today’s educators and school leaders are leaving behind a digital footprint of what their students, classroom, and schools are doing – and where they are going. In addition, these resources are free. With the budget crunches of today, these are powerful tools that need to be the focus for us to drive our curriculum. It is vital. Be sure to visit Part I: The Details of the Classroom Blogging Series.